ClusteR,D2 Coworking in the centre of Dublin City. |nterested? DoSpace, D2 5,000Sq Feet of converted warehouse in the heart of Silicon Docks! DoSpac has many unique collaboration points for it's 60+ members. Element78, D2 a beautifully designed office in Dublin city centre. We provide flexible coworking & dedicated desks and also serviced, private offices to companies at all stages of growth. Coworkinn, Sandyford 20 minutes from Dublin City centre by Luas, a great communirt of cowokers: come or a desk, tay for the people. Flexhuddle, Harold's Cross a collaborative work space . We don’t just provide the desks and chairs and meeting rooms, we are a vibrant community of hard working people. Dogpatch Labs, D1 A tech co-working space located in the iconic Chq building, in Dublin’s Silicon Docks, nurturing an innovative startup community embedded within Google's Tech Hub Network. 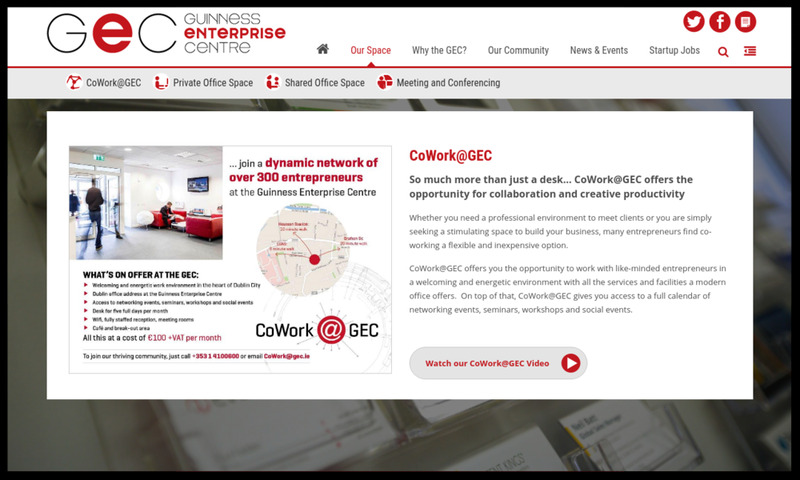 GEC Cooworking, D8 work with like-minded entrepreneurs in a welcoming and energetic environment with all the services and facilities a modern office offers. 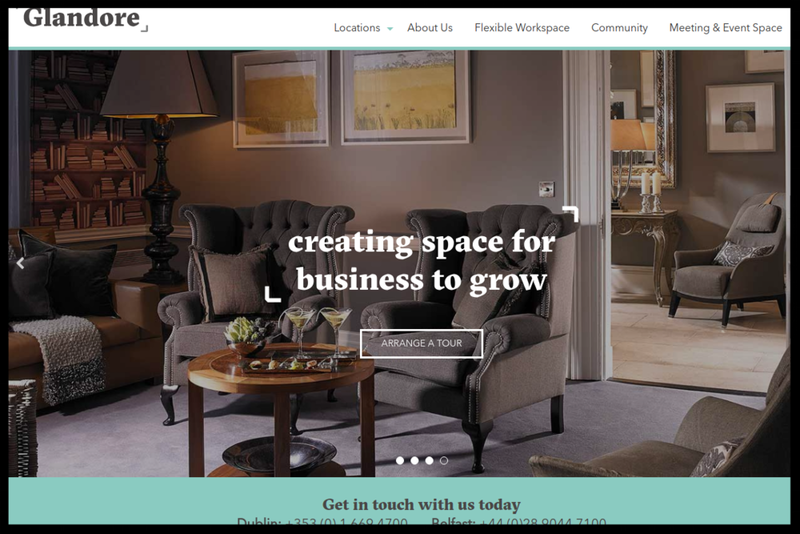 GLANDORE, D2 FAMILY OWNED AND MANAGED, OFFERING FULLY-FITTED, FLEXIBLE OFFICES, COWORKING SPACE, MEETING & EVENT SPACE AND AN EXCLUSIVE MEMBERS NETWOR, DUBLIN AND BELFAST. Sobo Works - Iconic Offices, D2 in the heart of ‘Silicon Docks ‘ Dublin 1, Sobo Works offers work spaces fully equipped with the latest and most reliable IT infrastructure. Studio9, D1 a shared workspace, We rent desk spaces to Freelancers and Small Businesses providing excellent facilities in a friendly and productive environment. Helping Networks, D1 Co-working space located in Center of Dublin. Helpingnetworks ofrece a sus clientes espacio individual en nuestro Co-working ubicado en pleno centro de Dublín. Office Suites Club, D2 Beautiful coworking spaces where small businesses & entrepreneurs can enjoy flexible part time desks.